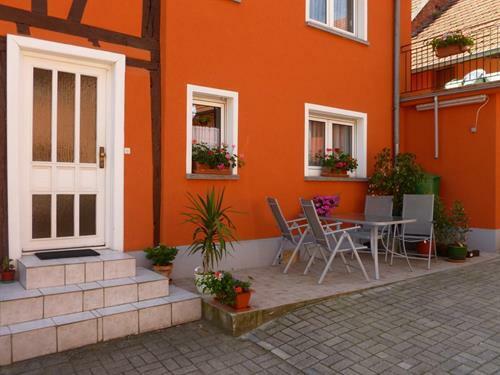 Two air-conditioned rooms in an annex adjoining the owner's house situated in a traditional village. 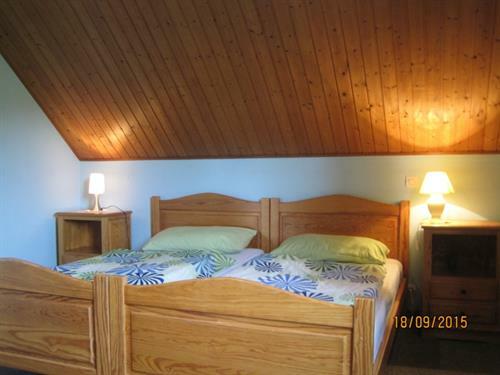 Room 2: 1 double bed, 1 single bed, bathroom, separate WC. Room 1: 1 bed 1.60 x 2.00 m, bathroom, separate WC. Breakfast served in a room reserved for guests with relaxation area. Garden furniture, parking in closed courtyard. 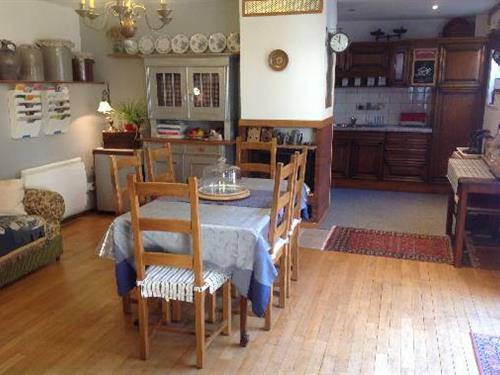 Kitchen, bikes and tandem available. Price discount as of the third night. Cycle track nearby. Gîte in the upstairs section of a house situated in the courtyard of the owner's residence, in the village. 3 bedrooms (RM1: 2 single beds, 12-sq metre terrace, RM2: 2 single beds, fully equipped washroom, RM3: 2 single beds), liv. room, landing converted into a lounge area (TV antenna socket), kitchen (microwave, wash. machine), second washroom, separate toilets. Cent. heating and sheets included, beds made up on arrival. Garden furniture, BBQ. Shared amenities: phone (prepaid holiday phonecard), enclosed courtyard, carpark, ping-pong. Two other gîtes on the premises. Gîte on the grnd floor of a house situated in the courtyard of the owner's residence, in the village. Gîte n°1450 in the house. 1 bedroom (2 single beds), kitchen (TV antenna socket), fully equipped washroom. Cent. heating included, beds made up on arrival. Garden furniture, BBQ. Wash. machine shared with the owner. Shared amenities : phone (prepaid holiday phonecard), enclosed courtyard, carpark, ping-pong. 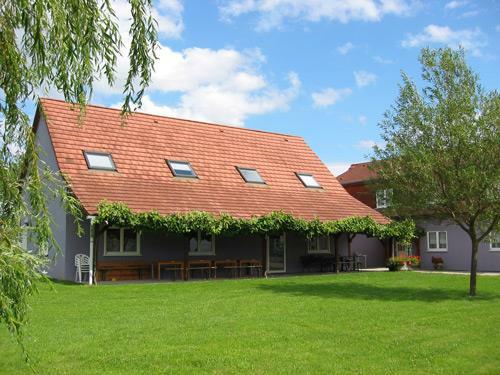 Gîte in the upstairs section of a former barn situated on the grounds of the owner's residence, in a border village near Franco-German cycling trails. RM1 (2 single beds), RM2 (2 single beds, baby's bed), kitchen-liv. room (microwave, TV ), washroom, separate toilets. Cent. heating included, beds made up on arrival. Garden furniture, BBQ. Gîte N°1593 on the same landing.Equipment for babies. Shared amenities: wash. machine, summer kitchen, parking in the enclosed courtyard, green outdoor area, swing, sandbox. 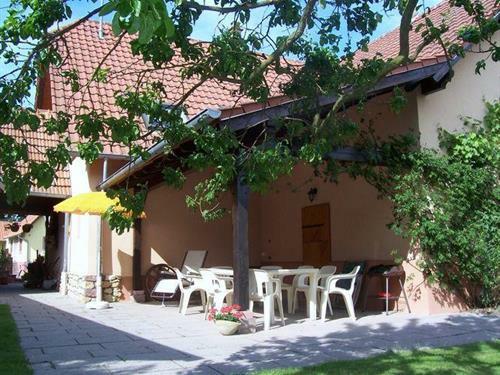 Gîte in the upstairs section of a former barn situated in the courtyard of the owner's residence, in a border village on a Franco-German cycling trail. RM1 (1 dble bed), RM2(3 single beds), kitchen-liv. 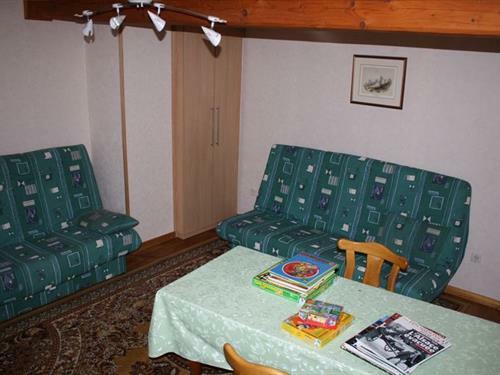 room giving on to a terrace 16m²(TV antenna socket, garden furniture, BBQ), washroom, separate toilets. Cent. heating included, beds made up on arrival. Second gîte on the same floor. Equipment for babies. Shared amenities: wash. machine, summer kitchen, parking in the enclosed courtyard, swing, sandbox, green outdoor area. Flower-decked gîte adjacent to N° 984, in the upstairs section of the owner's residence, situated on the outskirts of a village. Upstairs: 2 bedrooms (RM1: 1 dble bed, RM2: 2 single beds), large liv. room-kitchen area (TV), balcony, fully equipped washroom. Cent. heating and sheets included, beds made up on arrival. Garden furniture. Shared amenities: Wash. machine on the landing, covered terrace, green outdoor area, BBQ, swing, carpark, baby's bed on request. Restaurant on the premises. Flower-decked gîte adjacent to N° 983, in the upstairs section of the owner's residence, situated on the outskirts of a village. 3 bedrooms (RM1: 1 dble bed, RM2: 2 single beds, RM3: 2 single beds), liv. room-kitchen area (TV), washroom, separate toilets. Cent. heating and sheets included, beds made up on arrival. Garden furniture. Shared amenities: Wash. machine on the landing, covered terrace, green outdoor area, BBQ, carpark, baby's bed on request. Restaurant on the premises. Reposeful Guestroom in the country, enclosed by nature and horses. 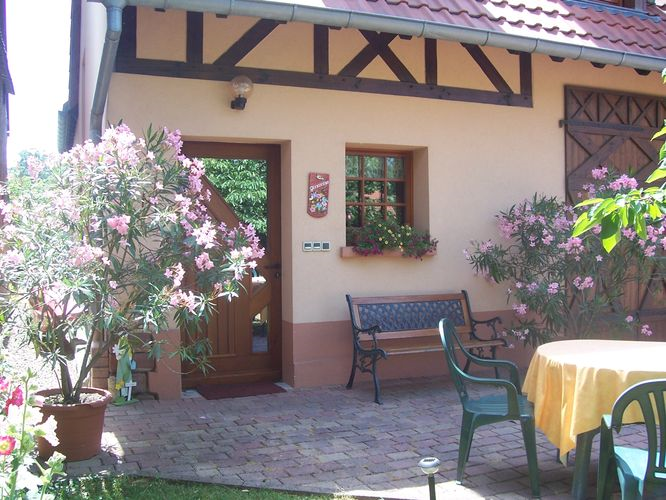 Gite situated at the edge of the village on a tourist cycle path, beside the Rhine. 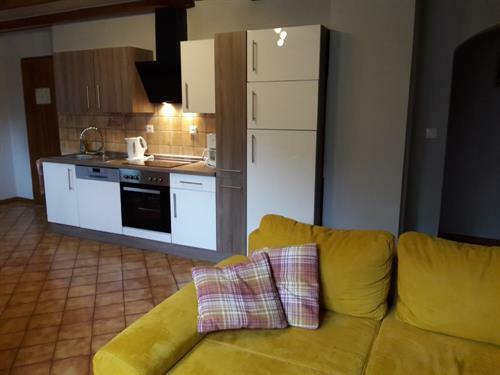 6 bedrooms with twin-beds - 6 bedrooms for 3 people (bunk-beds and single bed) - individual shower, wash-basin and kitchnette 5 bedrooms with twin-beds - 3 bedrooms for 3 people above the hall. 2 WCs, 6 wash-basins, 2 showers. Laundry with washing-machine. 4 WCs in the corridor. 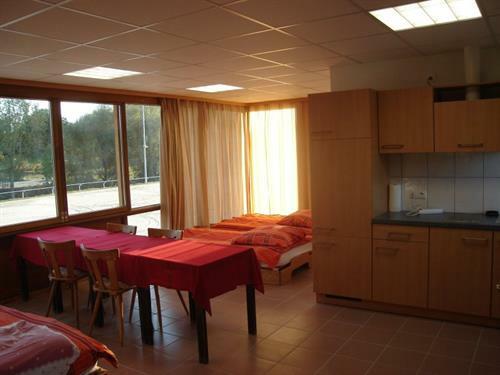 Parking, green space, terrace (45 m²), hall (100 m²), kitchen-corner. Catering on request. TV, telephone, sheels included. central-heating, barbecue, recreation ground close by. Prices on a sliding-scale according to length of stay. Groups : "Tarte flambée" (flame-tart) evenings on request. Registered by "Jeunesse et Sports" (Youth and Sports Ministry). Hall rental, canoe outings. Disabied access.